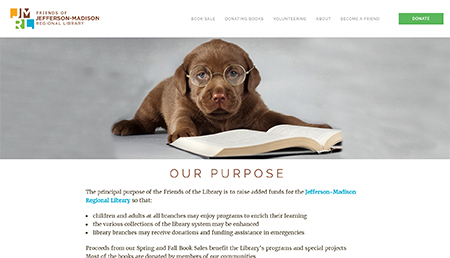 We originally did the site for the Jefferson-Madison Regional Library way back in 2004, with a slight update in 2010. The Friends of the Library is an organization that raises additional funds for various programs, collections, and other needs for the nine library locations and the Bookmobile. JMRL serves a population of over 200,000 residents. We did the original Friends of the Library site in 2007. Ten years later, we were overjoyed to do a re-design and tech upgrade. Our goal was to provide something that was simultaneously elegant and adorable.